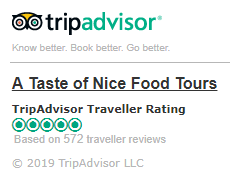 Come discover the history and culture of Nice, France, through our 5-star gourmet food and wine tours! We run morning and evening tours. Includes: Array of local specialities, surprises, lunch or dinner, and wine! FREE cancellation up to 24hrs before the tour! 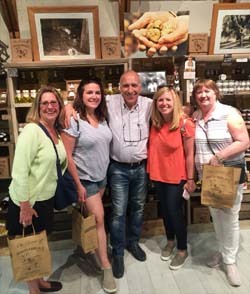 On the Pure Nice Food Tour, you get to taste your way through local specialities and wine. 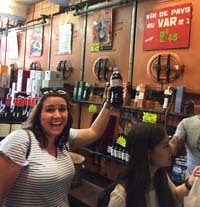 The morning food tour takes you to the Liberation market, away from the tourist trail. On the afternoon food tour we go to the best food shops and we have dinner in a Nicois restaurant. 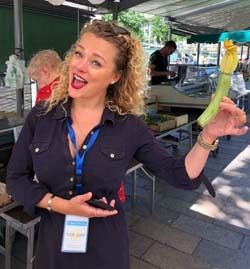 On this city walking tour, you will not only get a feel for the flavour of Niçois cuisine, but also the unique history, culture and heritage of Nice. We discover places few tourists would see and taste food you'd be hard pressed to find anywhere else in France or the world. We also talk about the locals' special relationship to wine at a local wine shop. les Petits Farcies—literally "the little stuffed ones"
Pissaladière—there is no such thing as too much onion! Reservation is mandatory - please book ahead! We offer the tour every day except Mondays. The tour lasts for about 4 hours. The tour starts at 10 am or 5 pm. There are additional start times on some days - check availability here! There is one set of steep & narrow stairs on the dinner food tour. If case of mobility issues, please contact us before the tour. Enough food is provided for lunch or dinner! Our precise tastings may change without prior notice. Please let us know of any dietary requirements prior to the tour and we'll do our best to accommodate them. For groups or special events such as your stag do or hen night, please contact us. We can adapt the tour to suit your special requirements and dates. We meet at 1 rue du Pontin, Old Nice. You'll find complete directions to our meeting point here. Go where the tour bus can't, go further than the walking tours, experience more with less effort! The Nice City Cycle Tour is the best introduction to the secrets of Nice. We cover the Old Town, the Promenade des Anglais, the Colline du Chateau and much more on our easy-to-ride bikes.